On Octobver 12 the world will go Black! Activision Blizzard are set to release Call of Duty: Black Ops 4 in time for the holiday season. With loads of hype building around this latest video game release, it has been speculated that die-hard gamers are set to ditch one of the most popular games in 2018 (Fortnite), in anticipation for the latest installment of Call of Duty (COD). What's more is that Activision will also be releasing their third quarter results on 8 November. With Better than expected second quarter results, record Mobile revenue and Mobile Net Bookings the company’s growth prospects are on point. “This was another strong quarter for Activision Blizzard. Our portfolio of global franchises enabled us to deliver record first half revenues and earnings per share,”- Bobby Kotick (CEO), of Activision Blizzard. Looking at the long-term chart we can see that the price action has been in an uptrend since 2016. 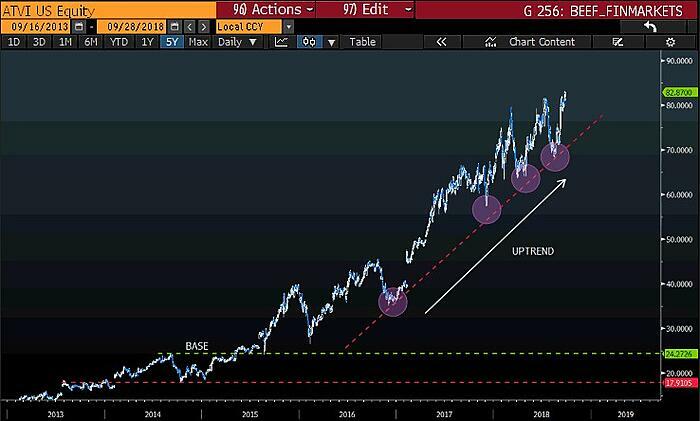 I am also noticing that there have been sharp drawdowns back to the uptrend support line (red dotted) over the years. I expect this to continue as the company grows over time. Zooming into the intraday chart, we can see that the share price has been on the rise since August as the due date of the new Call of Duty: Black Ops. 4 (#BlackOps4) is approaching fast. With the all new Battle Royal mode (#Blackout) added to the offering I expect the share price to rise. My portfolio target price is $87.71 and I expect some volatility along the way. Drop the “Noob” status and get your game up with some Activision Blizzard shares. 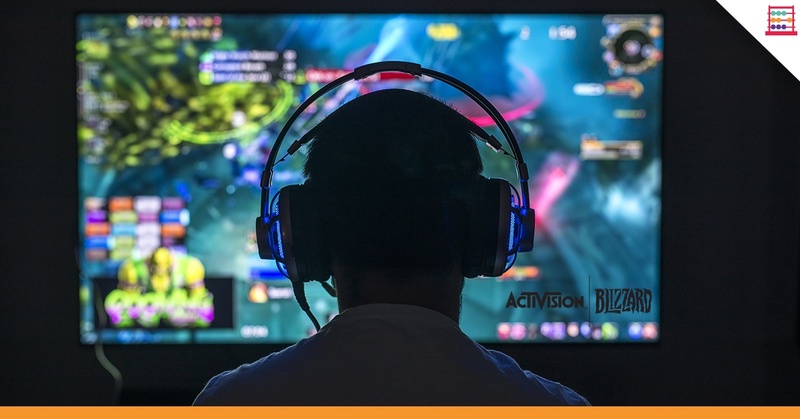 The best news of all is this stock is a #Trive50 share, which means 'Thrivalists' stand to pay $0 in brokerage fees when purchasing Activision Blizzard Inc. (ATVI) stock on EasyEquities. Activision formed in 1979 and developed numerous video games for the Atari 2600. Blizzard Entertainment was founded on February 8, 1991, under the name Silicon & Synapse. In 2008 Activision merged with Vivendi Games who owned Blizzard Entertainment to form the gigantic entertainment company we know today as Activision Blizzard Inc. The Call of Duty series is dubbed as one of the most popular video game franchises of all time with gamers total playing time at 25 Billion hours. Barry is a market analyst with GT247, with a wealth of experience in the investment markets. 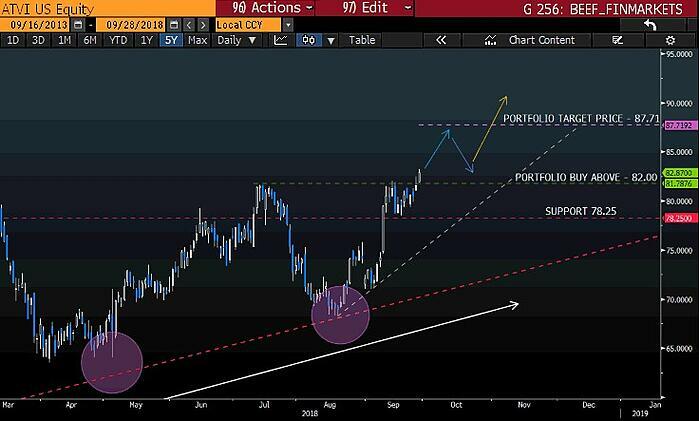 Now in his tenth year in the markets, Barry "The Beef" Dumas brings a combination of technical analysis and fundamental insights to the table.